Sustainability and Green refer to the designing and maintaining the built environment to in concert with economic and ecological needs. Federal agencies are required to achieve 30% energy and water reductions by 2015 and zero use of fossil fuel by 2030 with schools and municipalities facing similar requirements. JOC ( Job Order Contracting ) and SABER ( Air Force equivalent of JOC ) are optimal methods for efficiently planning, bidding, and executing sustainability projects with the funding available from billions of dollars via the American Recovery & Reinvestment Act ( ARRA ). Many “green” projects, however, suffer from poor planning and costly paperwork/contract documentation and project management issues largely associated with outdated contracting methods. JOC – Job Order Contracting – offers a remedy for EB (existing buildings) / LEED EB “ green “ renovation projects. 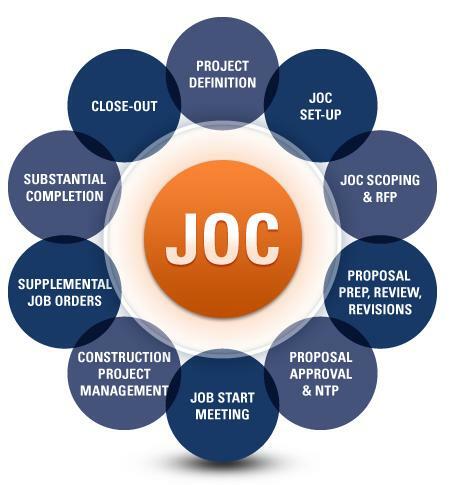 JOC – Job Order Contracting – allows the owner and contractor to work together from the beginning; scoping the project, and developing the plans thru specifications and requirements to completion of the sustainability / green renovation, repair or minor construction project(s), on time and within the approved budget. If owners decide to go the LEED® certification route, they can review current conditions with contractors and discuss construction concerns and associated remedies to reach established targets – up-front – with a firm fixed price for each delivery order, prior to issuing a notice to proceed. visit http://www.4clicks.com for more information on JOC / SABER / SATOC / MATOC / IDIQ / BOA / POCA …. Critical design stage information relative to specification of building elements is currently lost during design / bid stages ( and other phases). Above causes buildings to perform lower than design range due to improper / ineffective maintenance, repair, replacement (O&M) practices. It is possible to capture this data and create lifecycle building cost models, and associate O&M policies/procedures, as well as project and update associate costs today, at a fraction of the cost of developing the same later in the building life cycle. Yes the above could be accomplished with most FM Software technologies… only if however, they had customized, robust cost models, and standard reference cost data fully integrated within them … however they do not. The Federal Building in downtown Youngstown, Ohio, features an extensive use of natural light to illuminate offices and a white roof to reflect heat. It has LEED certification, the country’s most recognized seal of approval for green buildings. But the building is hardly a model of energy efficiency. According to an environmental assessment last year, it did not score high enough to qualify for the Energy Star label granted by the Environmental Protection Agency, which ranks buildings after looking at a year’s worth of utility bills. The building’s cooling system, a major gas guzzler, was one culprit. Another was its design: to get its LEED label, it racked up points for things like native landscaping rather than structural energy-saving features, according to a study by the General Services Administration, which owns the building. Buildings would provide the information voluntarily, said officials with the United States Green Building Council, the nonprofit organization that administers the LEED program, and the data would be kept confidential. But starting this year, the program also is requiring all newly constructed buildings to provide energy and water bills for the first five years of operation as a condition for certification. The label could be rescinded if the data is not produced, the officials said. The council’s own research suggests that a quarter of the new buildings that have been certified do not save as much energy as their designs predicted and that most do not track energy consumption once in use. And the program has been under attack from architects, engineers and energy experts who argue that because building performance is not tracked, the certification may be falling short in reducing emissions tied to global warming. Some experts have contended that the seal should be withheld until a building proves itself energy efficient, which is the cornerstone of what makes a building green, and that energy-use data from every rated building should be made public. Scot Horst, the council’s senior vice president for its certification program, said that any changes in the process would have to be made by consensus to ensure that the building industry would comply. Already, some construction lawyers have said that owners might face additional risk of lawsuits if buildings are found to underperform. The council is planning several meetings with builders, owners, developers and others around the country in September and October to promote its building performance initiative, which could lead to further revisions in the rating program to ensure buildings reduce energy consumption as much as they can. “If you’re not reducing carbon, you’re not doing your job,” he said. The LEED label, developed by the council in 1998 to have a third-party verification of a building’s environmental soundness, certifies new homes, schools and other buildings, as well as existing ones. (The certification for existing buildings is the only one currently tied to energy performance.) Its oldest and largest program, in terms of square footage, is the certification of new commercial and institutional buildings, with 1,946 projects already certified and 15,000 more that have applied for certification. Many other buildings include environmentally friendly features and advertise themselves as “green” but do not seek the LEED label. The program uses a point system based on a broad checklist of features and buildings can be certified by accumulating points on not just efficient energy use but also water conservation, proximity to public transportation, indoor air quality and use of environment-friendly materials. Council officials say that these other categories also help reduce energy use and emissions. And many architects and engineers praise the comprehensiveness of the label. But the wide scope of the program, many in the industry point out, also means that buildings have been able to get certified by accumulating most of their points through features like bamboo flooring, while paying little attention to optimizing energy use. Another problem is that the certification relies on energy models to predict how much energy a planned building will use, but council officials and many experts agree that such models are inexact. Once a building opens, it may use more energy than was predicted by the design. And how a building is used — how many occupants it has, for example — affects its energy consumption. “If the occupants don’t turn off the lights, the building doesn’t do as well as expected,” said Mark Frankel, technical director for the New Buildings Institute, which promotes improved energy performance in new commercial construction and conducted the research commissioned by the Green Building Council on LEED buildings. “In the real world, the mechanical systems may have problems, so that increases energy use,” Mr. Frankel said, adding that keeping track of energy use is rarely a priority for owners. LEED energy standards have grown more stringent over the years, and construction like the Youngstown federal building, built in 2002, would not be certified under the current version of the program, the G.S.A. study noted. The LEED standard goes through periodic revisions, and this year, the minimum energy requirements needed for the basic LEED certification for new buildings were raised. But in its own study last year of 121 new buildings certified through 2006, the Green Building Council found that more than half — 53 percent — did not qualify for the Energy Star label and 15 percent scored below 30 in that program, meaning they used more energy per square foot than at least 70 percent of comparable buildings in the existing national stock. Anecdotal information from follow-up research to that study indicated that the best-performing buildings had limited window areas and tended to be smaller. Sometimes, a building’s inhabitants are the first to notice energy-wasting features. At the Octagon, a LEED-certified residential rental building on Roosevelt Island in New York City, residents like Alan Siegal say that obvious energy savers, like motion sensors in the hallway, are hard to miss. “If there’s a lot of glass, is that going to be efficient?” he asked. Bruce Becker, whose company Becker and Becker Associates developed and owns the Octagon, said that the windows offer day lighting but conceded that there were plenty of opportunities to become more energy efficient. He said the Octagon would soon switch to a fuel cell system for heat and electricity, partly to cut energy costs at a time of a depressed rental market. Mr. Horst, the LEED executive, said that LEED may eventually move toward the E.P.A.’s Energy Star model, which attests to energy efficiency only for the year the label was given, similar to restaurant ratings. “Ultimately, where we want to be is, once you’re performing at a certain level, you continue to be recertified,” Mr. Horst said.